HarperAudio, 2004. 5 hours on 5 compact discs. When I saw the library had The Last Battle on audio CD, performed by Patrick Stewart, I snapped it up without a moment's hesitation. Patrick Stewart could make the phone book sound entertaining! 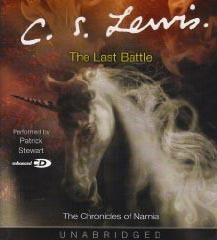 This is the last book of The Chronicles of Narnia, which I've read so often I've lost track of how many times. It struck me on this listening that this one isn't so much about the story as it is about describing the wonders of what heaven may be like. After all, the main characters don't win the last battle -- they are defeated, but then Aslan makes all wonderfully right. So I'm not sure you could really enjoy this book if you don't believe in heaven. If you do, however, here's a chance to glory in the magnificent voice of Patrick Stewart marvelling over the wonders of what may be in store for us. Definitely an uplifting treat!